London (AFP) – Liverpool are one step closer to a long-awaited Premier League title, but only just after a seven-goal thriller against Crystal Palace at Anfield, while Chelsea imploded in losing 2-0 at Arsenal. 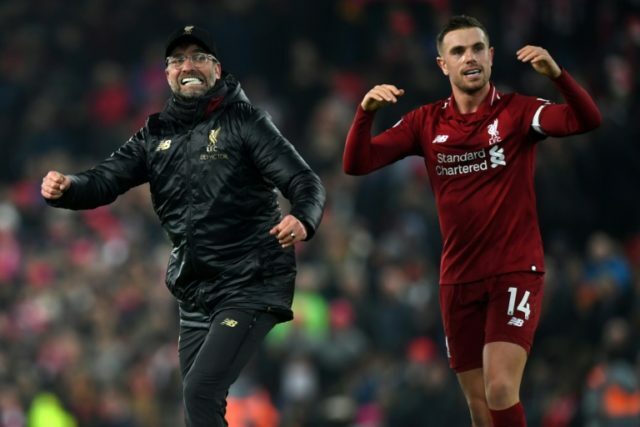 For the second consecutive week Liverpool got the job done by a solitary goal, but in stark contrast to a dogged 1-0 victory at Brighton last weekend, Jurgen Klopp’s men needed their forwards to come to the party and a touch of fortune to see off Crystal Palace 4-3. The Italian lambasted his players’ desire and commitment, labelling them “difficult to motivate”. Sarri must also, though, accept his measure of responsibility with Eden Hazard and N’Golo Kante again struggling in unfamiliar positions. Not many Chelsea managers have taken on the dressing room and succeeded in Roman Abramovich’s reign. Arsenal’s victory closed the Gunners to within three points of Chelsea in the fight for a top-four finish, but it is a rejuvenated United who look even more likely to beat Sarri’s men to Champions League qualification. A 2-1 win over Brighton was not the Red Devils’ best display under the Norwegian, but his influence was still decisive as Marcus Rashford’s stunning solo goal proved the difference between the sides. Shorn of Harry Kane, Dele Alli and Son Heung-min, Spurs needed Harry Winks’ first goal since 2016 to see off struggling Fulham 2-1 at Craven Cottage. Winks’ header with virtually the last action of 93 pulsating minutes ensures Spurs maintain a seven-point cushion over Arsenal and United. The England international had scored Tottenham’s equaliser before pulling up with a hamstring injury. Unlike Mauricio Pochettino’s Spurs who didn’t spend a penny on transfers in the summer, Marco Silva was handed £90 million worth of new arrivals to begin the challenge of taking on the top six at Everton. Of Everton’s big summer signings, Colombia’s World Cup hero Yerry Mina was left on the bench, while Andre Gomes, Richarlison and Bernard were all substituted by Silva in Saturday’s 2-1 defeat at Southampton. At the very least, Everton’s majority shareholder Farhad Moshiri would expect to be the best of the rest in seventh come the end of the season.